This goes for any activity, not just playing the ukulele. Sit up straight with the best posture that you can muster and breathe. Deep breaths counting in to 10 and out to 10. Spend 5 minutes just relaxing and breathing, there is no exact science to it, after all we aren’t attempting transcendental meditation or astral projection. Whatever breathing exercise helps you relax and chill out will work. I think we all would be happier people if we just took some time every day to focus on our breathing! Literally warm your hands, using warm water or friction, get those muscles ready for some stretches. 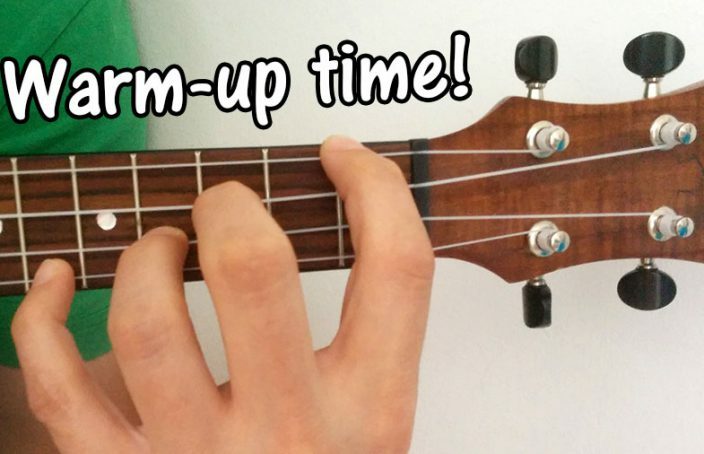 While you are at it use your hands and body heat to warm your ukulele a little. The wood sounds better and your fingers work better when they are warm! Not only should you stretch your fingers if possible stretch your body. As if you are getting ready to play sports or run, stretch your arms, neck, back, and legs. It may seem frivolous, but stretching gets the circulation going and improves memory and performance. Plus, it helps turn ukulele practice into a routine and ritual, which makes for the best practice. As for your hands start by holding all your fingers and gently pulling them towards the back of your arm. After stretching all your fingers at once, do each one, including the thumb individually. The key is to do it slowly and gently; stretches are for avoiding injury after all! As time progresses you will find you can stretch your fingers farther and farther towards your arm. Rotate your wrists and stretch them forward and backward, keep in mind to hold the stretch for about 10 seconds each time. Spread your fingers out as far as you can and hold them, make a fist and release. Again do what is comfortable and helps you play better, stretches vary between individuals and what they can physically do. Over time you will find new stretches to pinpoint problematic areas. For example, to help me use my pinky more I like to pretend I am making a dog shadow puppet. With the thumb as the ears and pinky as the lower jaw. By opening and closing the “mouth” it is good practice to learn to only move my pinky independent of my other fingers. Of course this exercise works best for your left hand as that is where your pinky movement will be the most difficult. This is a simple chromatic exercise that we use all of our fingers for. Index finger for the first note, middle for the second, ring for the third, and of course the pinky for the last note. Because of the re-entrant tuning of the ukulele this chromatic scale jumps around a little, but the key factor is to move all four fingers. You can play this scale all the way up the fretboard if you like. When you first start practicing it, go slow and make sure you do not miss a single note. If you really want to make the chromatic warmup a challenge, try plucking each string with a different finger on your right hand. On the first G string 1-2-3-4 use your index finger, on the next low C string use your middle, on the E string use your ring, and on the final A string use your right hand pinky. It is very difficult, but great practice for right hand fingerpicking! You can warmup with any scale you like, but with the ukulele the C major scale is an absolute must to be memorized. When preparing for practice or a show I will play this scale back and forth. Once you have it memorized make it your own, play it anyway you like. Overtime you can start throwing in other scales for your warmup. The key to this exercise is to stretch your pinky. Use your index finger to play the 1st fret and your pinky to play the 4th, after you have played it like that you can switch it up a little bit. For example, you can move the pinky from the 4th to 5th fret on each string to help stretch it even further, this is not easy and will take a lot of practice. Another good warmup exercise is to throw in some hammer-ons and pull-offs into your scales. Remember a hammer-on is when we pluck a string and then quickly hammer-on to the next note without plucking again. You can use the same chromatic scale above for this warm up, pluck the 1st fret of the G string and hammer your middle finger onto the 2nd fret. Do this again by plucking the 1st fret and hammering onto the 3rd with your middle finger, and then again by plucking the 1st fret and using the pinky to hammer-on to the 4th fret. And a pull-off is just the opposite of a hammer-on. We place our pinky on the 4th fret and pluck it, letting go while our index finger is on the 1st fret. Just like the hammer-ons we are playing two notes with one pluck. When you get really good you will be able to play multiple notes with one pluck of the string. As you learn to play the chromatic scale above faster and faster over time throw some hammer-ons, pull-offs, and even some trill in on occasion. This is great stretching and coordination for your fingers, and pretty soon your warmups will sound amazing! While doing these exercises be mindful of injury, especially with the pinky. It is very easy to injure your pinky while playing any stringed instrument. Sometimes I find that even after years of playing I can still over do it with the pinky on occasion. Some players avoid using the pinky all together, but even on the ukulele it will make you a better player to have that 4th finger practiced and playable. Your warmup routine will always take longer in the early days of practicing. After a few weeks you will find specific finger preps that will get quicker, however you should always warmup. Find your own exercise that suits your practice time. Some folks like to play certain songs or passages, while others have specific melodies they like to play. One of my favorite warmups in the early days of playing was Beethoven’s Ode to Joy, especially when you mix in chords with specific melody it makes for a great exercise. Whatever warmup ritual you like best just stick to it and make it a habit. Great website and very informative. No matter how long you play, there is always more to learn. This is very useful information for me who is new on this ukulele thing. I hope you teach more on the website.